Rahul Dravid A fan page dedicated to the greatest cricketer ever. have u guys met dravid in person??? would u mind giving me some suggestions to improve it??? best of luck for ur site..... "
Hi Athul,Yeah we've met Rahul several times. We made the site almost 7 years back andhaven't updated it in a long time. Infact it's dead. Thanks for the msg..your page is nice too. which idiot said that this is not a good site. This is perhaps the best site i have visited on Rahul Dravid. 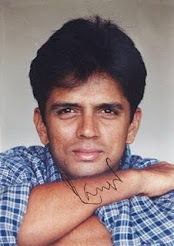 The Rarest Pictures of Rahul Dravid for you.An exclusive collection. RAHUL DRAVID IN TOP 10 OF ODI AND TEST..
RAHUL DRAVID THE BEST TEST BATSMAN IN THE WORLD?